Your non invasive healing sessions are conducted confidentially either in person at my Spiritual Centre in Poundbury, Dorchester, Dorset, UK. Or via distance healing over the phone or Skype. Emma uses all of her health training in her healing alongside the help of three of her main Guides. 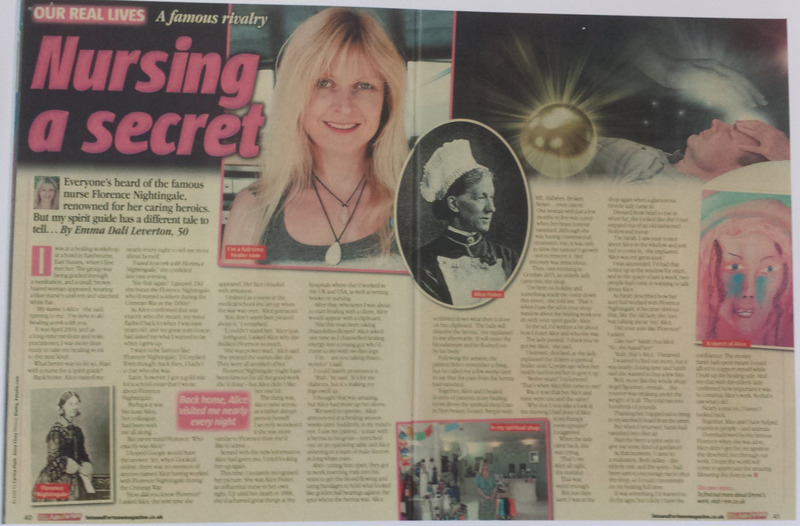 Her Healing Guide, the eminent and truly wonderful Alice Fisher oversees all Spiritual healing given, https://en.wikipedia.org/wiki/Alice_Fisher_(nurse) A beautiful two page article was published in September 2016 about Alice and Emma’s work together in Take a Break’s Fate and Fortune magazine. Alice and her team of doctors perform the majority of all healing, including surgery and emotional healing aided by Emma’s main Guide ‘Hung Chi’ who will work on your energy fields, aura and meridians; helping to clear blockages so that Chi/Qi/Ki may move more freely and her Native American guide ‘Feather’ looks closely at nutrition and dietary aspects. Emma has seen over five hundred patients with complaints as diverse as tumors, hernias, cancers, skin problems, gynecological issues, eating disorders, blood infections, parasites, hair problems, emotional issues, phobias, anxieties, nervous complaints, weight issues, sleep problems, skeletal illnesses, mobility disabilities and many, many more. Spiritual Trance Healing and Emma’s unique Mind Body Spirit approach, bringing together all of her healing training, is able to see anyone who has any health issue. Prior to your session please arrive on time with comfortable clothes. Anyone who is intoxicated will be refused healing. Your first consultation will last approximately two hours. An information sheet regarding the healing process will be given to you to read, sign and keep, please feel free to ask as many questions as needed. Then a confidential medical form will be completed by Emma. She will begin by discussing your medical history, current medical intervention and your emotional state of well being. Your lifestyle and diet will also be discussed etc. She will look at your auric field, chakras, take your pulses and look at your tongue to get an overall picture of your general state of health and to ascertain imbalances and points of weakness. Healing preparation will be given with auric sound therapy and 100% natural organic essence, Qi stroking may also be appropriate, all three will be explained thoroughly at the time. Throughout this pre healing stage Emma is already tuning in to her Guides and noting messages being sent from Spirit regarding your healing and state of health, she will also start to sense your ailments in her own body. Your appointment will continue with your Healing session. Healing is given either seated or on the massage couch with soft music playing, you don’t have to do anything except relax. You may experience warmth, cooling sensations, a sense of letting go, euphoria, sleepiness, see colours, memories, a sense of calm and well being or a mixture of any of these things. You do not however need to feel anything for the healing to have an effect. Emma will connect directly with Spirit and work in a state of semi trance. Alice will come through and oversee proceedings talking to Emma at all times, you will not see her although some people can sense her; you may also feel subtle cool breezes and hear a few knocks and taps, they are not alarming. Emma’s body is used as a vessel to connect you to the vital life force energy, Chi, to heal your body holistically. This is known as Trance Healing, which has been described as’ Reiki with a Turbo Boost’. It differs from Reiki in that Emma connects directly with Spirit and as they draw close, Spirit energy is delivered through her to you. Naturally she will be sensing, picking up and often feeling all of your medical problems so that a total understanding is manifested. Emma will place her hands on your body, they may be very warm, very cold or slightly electric and can go through all three stages with some clients, this won’t be uncomfortable. Spirit will know where to deliver the healing and/or perform surgery if this is needed; at no time will this be painful but some people have said they felt something a little odd as blockages and areas of trouble are targeted. Your whole being will receive healing but especially areas of need. When working Emma will be in a state of semi-altered consciousness, or Trance, in order to connect with Spirit; she will be working silently. What is actually happening is that Emma is being shown a scan of your body and watching your healing. Procedures are being explained and dietary deficiencies, blockages, areas of disharmony and old injuries talked through. 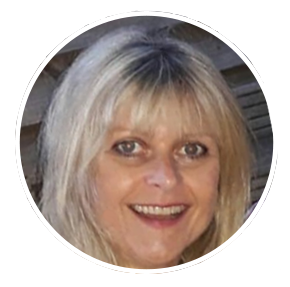 Alice will be discussing exactly what is needed, what is happening and giving advice for you to continue your healing moving forward from your session. Trance Healing is a very relaxing and uplifting experience but if you feel at all worried about this I am able to give you just pure Reiki and if at any time you feel uncomfortable you can of course ask for the session to finish; this has never happened but you should at no time feel uncomfortable. After your healing has finished. Emma will disconnect from source and give you full feedback and recommendations for you to continue your healing at home. You can also discuss what you experienced if you wish. After healing your vibration will have been raised but everyone does react differently, some clients feel wiped out, others are bursting with energy. It is advisable to take a slow approach to life for 24 hours after healing, drinking plenty of pure water and abstaining from alcohol for at least two days, preferably three. Healing will not cause harm or disruption to any medication that you may be taking, it can only help, never harm. Healing energies will reach their optimum within 3 days of your session, latent problems may come out in order to be dispelled and healed; this is a totally natural process of healing. Everyone responds differently and of course it depends on each individual problem and there can be no guarantees. Many clients feel that they wish to have further healing, I would recommend once a month as an optimum time although some find their symptoms so reduced that they never need to return and can progress on their own. Every being is so different and we are all individual in how we react and heal. Trance Healing will have a profound, positive effect on the majority of clients and then it is up to you to monitor and take responsibility for your progress going forward. Any further healing sessions will last for an hour. Trance Healing is an alternative therapy and in no way should go against any advice from your doctor. Distance Healing – what to expect. Please read the above about healing in person as most will apply. Distance Healing can have just as profound an effect as in person with clients reporting incredible results remotely. At the time of booking you will be sent an information sheet regarding your session. Please read this and send a confirmation email agreeing to the terms and conditions. Your healing will be in three parts. Please call 01305 751977 or Skype (Emma Dali Leverton – please send a friend request at least 48hour prior to your session) at your appointment time. Emma will complete your confidential medical form with you as above. This will take approximately an hour. She will then hang up and go and do your healing. Whilst Emma is in trance performing your healing remotely it is essential that you rest quietly either seated or laying down. Once the healing is complete Emma will call you back immediately to your landline, WhatsApp or Skype. Full feedback will be given exactly as it would be in person. Your first session will take approximately two hours in total with any subsequent sessions lasting an hour. All healing is priced at £60 for your first consultation, which includes an in-depth diagnosis, treatment plan and healing and £40 for any follow up appointments taken within a year of commencement. Having had many years of experience working with young people, I am more than happy to see younger people however, anyone under the age of 18 must be accompanied by an adult. Healing is also available for animals, please see here. Please note, healing is strictly on a one to one basis. I feel relaxed, grounded and powerful again. Thank you so much for helping me to regain my strength and find the real me, I’d forgotten who I was.